I know that the FAA has a lot on its pull-out tray these days – what with trying to keep airplanes in the air and TSA ball-grabbers out of the headlines – but here’s one more addition to their to-do list. 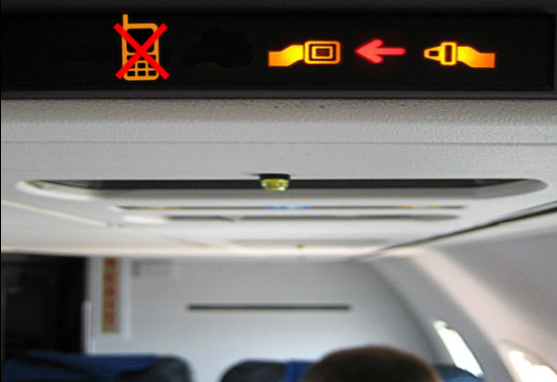 It’s high time for a redesign of Airplane warning lights, which will replace the No Smoking sign with a No Cell Phone sign, so as to warn passengers against doing something that they actually might actually think to do. Smoking was banned from air travel one toe at a time starting in ‘88. Practically a generation ago, but I guess they think that we still haven’t learned the rules. Who is still about to light up on an airplane if not for the No Smoking sign lighting up first? Maybe Brendan Fraser from Blast from the Past, or Leopold from Kate & Leopold, or Brendan Fraser from Encino Man. But those are the only people I can think of. But 23 years later the reminder still rings, lit obsessively above every seat like some dated Warhol print. So, let me upgrade you: the No Cell Phone sign. Which is a reminder that we actually need. Because even though we know that our cell phones are supposed to remain in the off position, it’s hard for us to do the right thing, mookie. It’s not our fault though, whenever our activity level drops below a certain decibel, we instinctually go for the phone to see what’s there. Right or wrong track, we were born this way. A pause in a conversation, a commercial break, a traffic light turning red – whatever the pause, we whip it out. I’ll even step so far as to say that there is no greater certainty in this entire world than you checking your phone when the person you are eating dinner with gets up to go to the bathroom. And air travel is full of these pauses, of the moments that make our thumbs twitch. So to enforce phone-abstinence on airplanes, bombardment is a req. You know, like, by way of a warning light 3 feet in front of every single one of our faces.